This species is accepted, and its native range is Africa. A terrestrial or epiphytic herb (16–)28–30(–40) cm. high, entirely glabrous. Pseudobulbs congested, ovoid, ovoid-oblong or stout and cylindrical, (2–)2.5–4 cm. long, 1-leaved, concealed and exceeded by several pale brown, ovate-elliptic, acute, imbricate, evanescent cataphylls. Leaves oblong-oblanceolate or oblong-elliptic, acute, duplicate, particularly towards base; lamina (10–)15–28(–40) cm. long, 2.5–4.5(–6) cm. broad, with the median nerve prominent on lower surface, greyish green, with darker green transverse, irregular banding or mottling; petiole 1–8 cm., regularly articulate. Inflorescence simple or with 1 or 2 short branches, 5–12(–20) cm. long, 3–4 cm. broad, erect, lax, 6–12(–20)-flowered, sometimes branched at base; bracts lanceolate, acuminate, scarious, lowermost to 17 mm. long, uppermost to 4 mm. long. Flowers porrect; sepals and petals translucent greenish white or pinkish green, sometimes straw-coloured; lip greenish white or cream with rose-pink nerves on the side lobes and 2 rose-pink blotches at the base of the mid-lobe; calli white. Spur greenish white, flushed rose-pink or brownish green; column cream; pedicel and ovary slender, 10–13(–15) mm. long. Spur short, stout, oblong-clavate, rounded, straight, 4–5 mm. long. Dorsal sepal linear-ligulate or linear-elliptic, obtuse to acute, 3-nerved, incurved, (8–)10–12(–13) mm. long, 2–3.2 mm. broad; lateral sepals linear-ligulate or narrowly oblanceolate-oblong, falcate, obtuse to acute, 3-nerved, (6–)7.5–9(–11) mm. long, 2–3.3(–4.6) mm. broad. Petals oblong-elliptic, oblique, acute, 3-nerved, broader than sepals, (8.3–)10–11.2 mm. long, (2–)3.3–4.6 mm. broad. Lip projected forwards, articulated at the base, distinctly 3-lobed, subquadrate in outline, glabrous, 7–9 mm. long; mid-lobe broadly obovate or reniform, abruptly and shortly clawed at the base, lobulate, retuse or ± truncate, longer than side lobes, 3.5–4.2 mm. long, (6–)7–8(–10) mm. broad; side lobes semiobovate, rounded, not saccate at the base, erect, somewhat incurved, nerves not prominent, shorter than mid-lobe; disc with 2 approximate, obliquely semiobovate, divergent basal keels, glabrous. Column erect, oblong, oblique at base or with a short foot, 4–5 mm. long, 2 mm. broad; anther oblong, ± 2.2 mm. long. 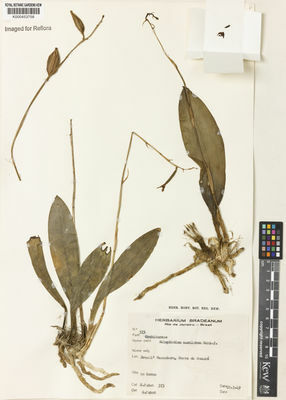 Amongst leaf-mould in shade in rain-forest, rocky scrub near the sea, shady river banks or epiphytic on savannah trees; 0–1200 m.
Glabrous, terrestrial herb 20–40 cm high; roots stout, c. 4 mm in diameter. Pseudobulbs 2–4 × 1.5–2 cm, ovoid, oblong or cylindrical, covered when young with pale brown imbricate cataphylls, 1-leafed. 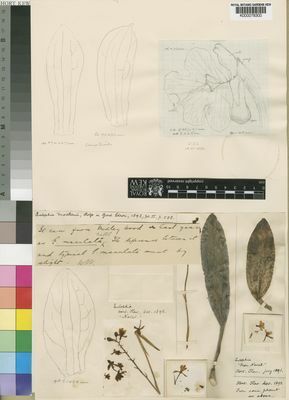 Leaf with a petiole 1–2 cm long, articulated ± at the base; lamina 10–30 × 2.5–5 cm, oblong-oblanceolate or oblong-elliptic, conduplicate towards the base, coriaceous, grey-green mottled with dark green. Inflorescence erect, simple or with 1–2 short branches, fairly laxly 10–20-flowered. Pedicel and ovary 10–12 mm long. Bracts lanceolate, acuminate, up to 20 mm long at base of the inflorescence. Sepals and petals greenish-white, greenish-pink or straw-coloured; lip white with 2 purple-red blotches at the base of the mid-lobe; side lobes purple-veined. Sepals 7–13 × 2–3.2 mm, linear-ligulate or narrowly oblanceolate, obtuse to acute, the dorsal sepal erect, the lateral sepals deflexed. Petals 8.5–11 × 2–4.5 mm, oblong-elliptic, oblique, obtuse. Lip 7–9 mm long, 3-lobed; side lobes erect; mid-lobe 3.5–4.2 mm long, 6–10 mm wide, broadly obovate or reniform, emarginate; disk with 2 approximate, divergent, glabrous basal keels; spur 4–5 mm long, stout, straight, bulbous at tip. Column 4–5 mm long, 2 mm wide, oblique at base or with a short foot. Naturalizada en Colombia; Alt. 500 - 1200 m.; Andes. 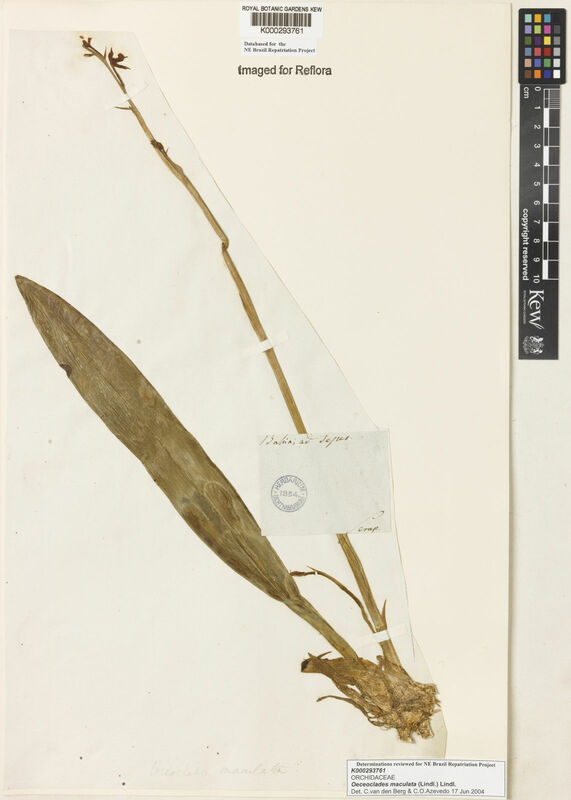 Glabrous, terrestrial herb 20–40 cm high; roots stout, c. 4 mm in diameter.Pseudobulbs 2–4 × 1.5–2 cm, ovoid, oblong or cylindrical, covered when young with pale brown imbricate cataphylls, 1-leafed.Leaf with a petiole 1–2 cm long, articulated ± at the base; lamina 10–30 × 2.5–5 cm, oblong-oblanceolate or oblong-elliptic, conduplicate towards the base, coriaceous, grey-green mottled with dark green.Inflorescence erect, simple or with 1–2 short branches, fairly laxly 10–20-flowered.Pedicel and ovary 10–12 mm long; bracts lanceolate, acuminate, up to 20 mm long at base of the inflorescence.Sepals and petals greenish-white, greenish-pink or straw-coloured; lip white with 2 purple-red blotches at the base of the mid-lobe; side lobes purple-veined.Sepals 7–13 × 2–3.2 mm, linear-ligulate or narrowly oblanceolate, obtuse to acute, the dorsal sepal erect, the lateral sepals deflexed.Petals 8.5–11 × 2–4.5 mm, oblong-elliptic, oblique, obtuse.Lip 7–9 mm long, 3-lobed; side lobes erect; mid-lobe 3.5–4.2 mm long, 6–10 mm wide, broadly obovate or reniform, emarginate; disk with 2 approximate, divergent, glabrous basal keels; spur 4–5 mm long, stout, straight, bulbous at tip.Column 4–5 mm long, 2 mm wide, oblique at base or with a short foot. A terrestrial or epiphytic herb (16–)28–30(–40) cm. high, entirely glabrous; roots stout, verruculose. Pseudobulbs congested, ovoid, ovoid-oblong or stout and cylindrical, (2–)2.5–4 cm. long, 1-leaved, concealed and exceeded by several pale brown, ovate-elliptic, acute, imbricate, evanescent cataphylls. Leaves oblong-oblanceolate or oblong-elliptic, acute, duplicate, particularly towards base; lamina (10–)15–28(–40) cm. long, 2.5–4.5(–6) cm. broad, with the median nerve prominent on lower surface, greyish green, with darker green transverse, irregular banding or mottling; petiole 1–8 cm., regularly articulate. Inflorescence simple or with 1 or 2 short branches, 5–12(–20) cm. long, 3–4 cm. broad, erect, lax, 6–12(–20)-flowered, sometimes branched at base; bracts lanceolate, acuminate, scarious, lowermost to 17 mm. long, uppermost to 4 mm. long. Flowers porrect; sepals and petals translucent greenish white or pinkish green, sometimes straw-coloured; lip greenish white or cream with rose-pink nerves on the side lobes and 2 rose-pink blotches at the base of the mid-lobe; calli white; spur greenish white, flushed rose-pink or brownish green; column cream; pedicel and ovary slender, 10–13(–15) mm. long. Dorsal sepal linear-ligulate or linear-elliptic, obtuse to acute, 3-nerved, incurved, (8–)10–12(–13) mm. long, 2–3.2 mm. broad; lateral sepals linear-ligulate or narrowly oblanceolate-oblong, falcate, obtuse to acute, 3-nerved, (6–)7.5–9(–11) mm. long, 2–3.3(–4.6) mm. broad. Petals oblong-elliptic, oblique, acute, 3-nerved, broader than sepals, (8.3–)10–11.2 mm. long, (2–)3.3–4.6 mm. broad. Lip projected forwards, articulated at the base, distinctly 3-lobed, subquadrate in outline, glabrous, 7–9 mm. long; mid-lobe broadly obovate or reniform, abruptly and shortly clawed at the base, lobulate, retuse or ± truncate, longer than side lobes, 3.5–4.2 mm. long, (6–)7–8(–10) mm. broad; side lobes semiobovate, rounded, not saccate at the base, erect, somewhat incurved, nerves not prominent, shorter than mid-lobe; disc with 2 approximate, obliquely semiobovate, divergent basal keels, glabrous; spur short, stout, oblong-clavate, rounded, straight, 4–5 mm. long. Column erect, oblong, oblique at base or with a short foot, 4–5 mm. long, 2 mm. broad; anther oblong, ± 2.2 mm. long. Argentina Northeast, Argentina Northwest, Bahamas, Belize, Bolivia, Brazil North, Brazil Northeast, Brazil South, Brazil Southeast, Brazil West-Central, Cayman Is., Colombia, Costa Rica, Cuba, Dominican Republic, Ecuador, Florida, French Guiana, Guatemala, Guyana, Haiti, Honduras, Jamaica, Leeward Is., Mexico Southeast, Netherlands Antilles, Panamá, Paraguay, Peru, Puerto Rico, Suriname, Trinidad-Tobago, Venezuela, Windward Is. Eulophidium mackenii (Rolfe ex Hemsl.) Schltr. Cohen, I.M. & Ackerman, J.D. (2009). Oeceoclades maculata, an alien tropical orchid in a Caribbean rainforest Annals of Botany 104: 557-563. Luke, Q. (2005). 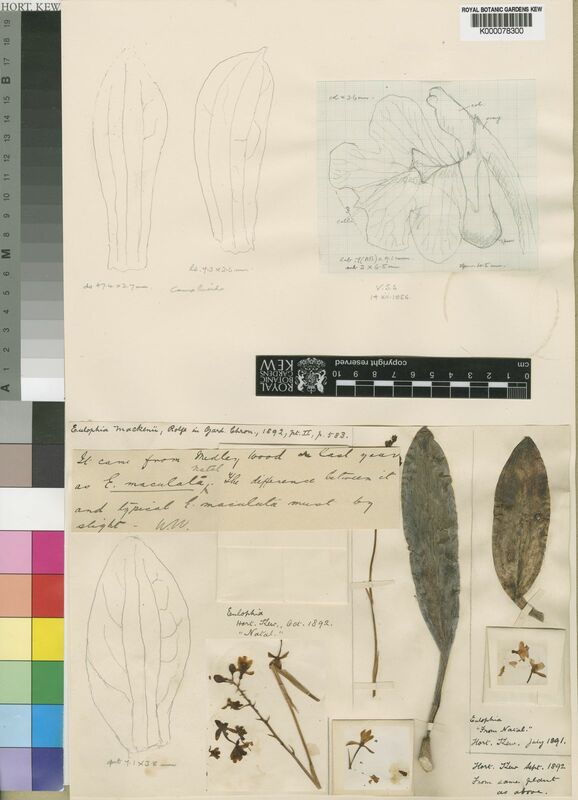 Annotated checklist of the plants of the Shimba Hills, Kwale District, Kenya Journal of the East Africa Natural History Society and National Museum 94: 5-120.
de Fraga, C.N. & Peixoto, A.L. (2004). Florística e ecologia das Orchidaceae das restingas do estado do Espírito Santo Rodriguésia; Revista do Instituto de Biologia Vegetal, Jardim Botânico e Estaçao Biologica do Itatiaya 55: 5-20. Sayers, B. & Du Plooy, H. (2003). 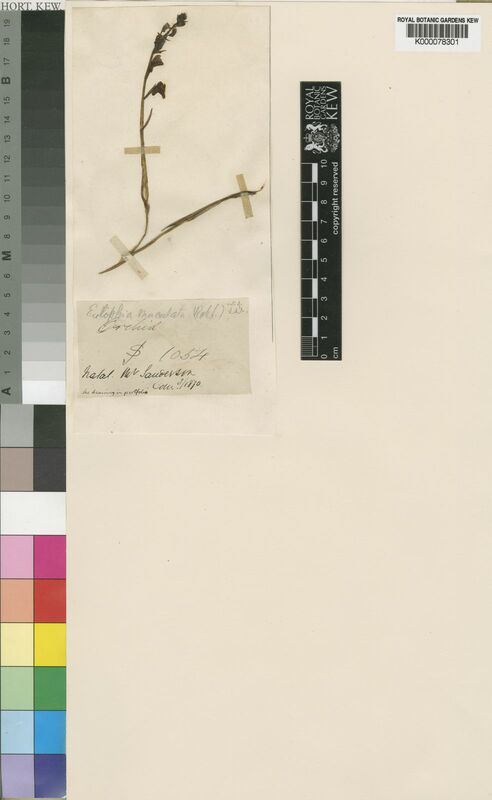 Additions to the Orchid Flora of Belize Lankesteriana 8: 1-3. Garay & Taylor in Bot. Mus. Leafl. Harv. Univ. 24: 266 (1976). Summerh. in Bulletin du Jardin Botanique de l'État a Bruxelles 27: 397 (1957). Lindl., Gen. Sp. Orch. Pl. : 237 (1833).